For information about SLiMSuite, please visit the EdwardsLab webpage and the SLiMSuite blog. Help and documentation for the REST servers can also be found at the REST homepage. If in doubt, please email: richard.edwards@unsw.edu.au. 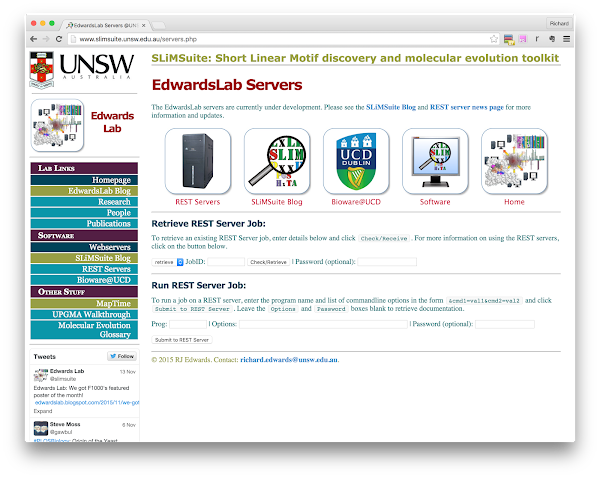 Several EdwardsLab publications also cover motifs and SLiMSuite tools. NOTE: For this workshop, you do not need to install SLiMSuite. You will need Cytoscape and the SLiMScape app for the later parts. The current SLiMSuite release is 2015-11-30 and can be downloaded by clicking the button (left). In addition to the tarball available via the links above, SLiMSuite is now available as a GitHub repository (right). See also: Installation and Setup. NOTE: Some of the jobs take a while to run and the SLiMSuite servers have limited resources. It would therefore be useful if you could click on the example JobID links rather than trying to run every example REST command yourself. The first output tab (and the log tab) will show you the run times for that job, so you can see which jobs are fast or slow before you experiment. ELM. Visit http://http://www.elm.eu.org/ and enter your protein of choice as Uniprot identifier or accession number in the box. (Identifiers will auto-complete and fill in some extra details.) For non-Uniprot protein sequences, you can also enter fasta format. Try this now with P03070 (LT_SV40) or P03254 (E1A_ADE02). Each of them should have a True Positive LIG_Rb_LxCxE_1 motif. NOTE: The ELM alias currently searches the 2015 ELM classes. The SLiMSearch server is accessible at: http://slim.ucd.ie/slimsearch/. This has been recently updated to Version 4 and now brings in a lot of information, so it is recommended that you read the Help pages for the server. Human protein PRDM16 is particularly interesting: it does not have an annotated ELM but does match a region annotated to interact with CTBP1. (See the Region column - Expand the instance Feature annotations for a clearer look.) This kind of search can be a good way of identifying new instances of known motifs - some of which may be in the literature but may not have yet made it into database annotation. Repeating the SLiMSearch analysis with the redefined motif (P[EILMV][DN]L[ARST]) gives a greater density of known ELMs (see the Motif column) in the top ranked motifs: http://slim.ucd.ie/rest/#/slimsearch/annotations?jobId=L41BRpXQ1oTD6ByDuUSqjWbQZ22WBKbw. When you have a lot of motif predictions, it can be tiresome and error-prone to manually scan them for things that look familiar. 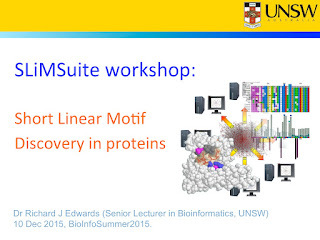 SLiMSuite has a tool called CompariMotif, which compares sets of motifs for similarity. The best advice is to save the compare output table (retrieve&jobid=15120900005&outfmt=compare), open it up in Excel and sort on Score. Alternatively, use the CompariMotif server at http://bioware.ucd.ie. In this case, we can see that even though the "true" motif has the most support, it is also expected to occur more by chance. It is enriched, but not enough to survive the multiple testing correction of SLiMChance. Though not of interest here, the pUnd statistics can be used to look for depletion/avoidance of a particular motif in a dataset. We're now going to fire up Cytoscape and have a quick look at the SLiMScape app. This is fairly well described in the paper, so we will just look at the main ways to run the server. If you've not used Cytoscape before, you'll want to visit the Cytoscape website and watch the introduction video, before installing it. In the SLiMFinder tab, enter 15120900003 in the Run ID box and hit Retrieve. Explore the results. Connections are UPC relationships in the data. The most useful thing of having access to SLiMSuite through Cytoscape is to be able to use it to explore PPI networks and select nodes for analysis. There are in-built tools to get PPI data into Cytoscape. For SLiMSuite, the ID must be a Uniprot ID or accession number, or a Node must have "Uniprot" attribute. Rename the HubUni and SpokeUni fields to name and attribute them to Source Node and Target Node attributes. Make Hub the Source, Spoke the Target and Evidence the Interaction Type then import. Select the nodes that are shared interactors of both CtBP proteins. Modify the masking settings to include disorder, conservation and feature masking. The link to the PowerPoint slides results in a "File not found". Could the link be updated? Link updated. Let me know if there are still issues.